Experience the beautiful diversity of wildlife in Uganda and you take part in the thrilling walking adventures through the country. However why not interact with the local-people who live their day to day lives neighbored by gallant gorillas, huge hippos as well as playful chimpanzees? Village walks in the rural communities present the most rewarding experience of the everyday life of a local Ugandan, since the tours are guided by people from these very villages. Marvel at the people performing long ago practices like the housewife kneeling by flat stones grinding millet, the blacksmith curving out machetes from shapeless iron, as well as the traditional healer looking for medicinal plants he uses to treat the injured or sick. You will get an opportunity to visit one of the traditional homesteads, and get an insight of how people work, entertain themselves and cook yet without electricity or even running water. Perhaps you will visit a village school alternatively a nursery, established with funds from this tourism. You may also meet the traditional birth-attendant – a great help for mothers living in the rural areas. You can also visit a distillery where the strong banana gin called waragi is made. The Customs in every village echo the local environment ranging from the cold Rwenzori foothills as well as mist covered slopes of the verdant Bwindi, to the arid savannah as well as the peaceful banks of the great River Nile. You will listen to the legendary tales narrated by the village elders of each village, and these have been passed from one generation to another. Well Trained guides acquired from these villages lead tours across the neighboring forests, wetlands and hills, and they are well skilled at sighting reserved fauna hiding in the vegetation, as well as identifying the local medicinal plants in addition to recognizing the sounds made by the birds. 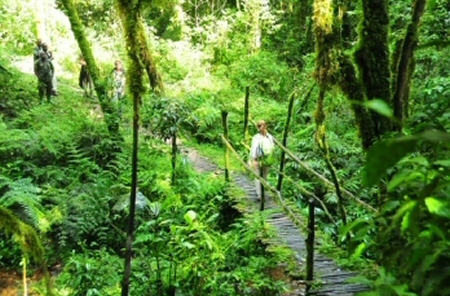 Nature Walks are conducted all through the country – regardless of whether you are searching for the endemic 3horned chameleon on the bottom of Mount Rwenzori, a unusual blue turaco within the forest cover or the bushbucks run between the different trees. This is a great way to experience the local wildlife as well as interact with the resident people. And evidently, the scenery in Uganda is very magnificent with flourishing papyrus wetlands, verdant forests, volcanic peaks, plus waterfalls, so don’t forget to bring along a pair of binoculars plus a camera so that you don’t miss out on all this beauty! Generating money through preserving the pristine environment has encouraged local communities to well conserve the habitats as well as the wildlife that are neighboring them. This Nature Walks is not only enjoyable but also very crucial in ensuring that the terrain remains undamaged so that visitors coming into Uganda can also get the opportunity to enjoy this beauty even in many years to come.